Kalawati Eknath Mangela and Parvati Bai Somna do not consider themselves fisherwomen any more. Every time they cast nets in the Arabian Sea, off the Tadgam beach in Valsad district of Gujarat, all they catch is garbage. "We have turned into kachrawalis (ragpickers). Ten years ago our daily fish catch would fetch Rs 250; now even Rs 20 a day is tough," said Parvati, 50, standing waist-deep in sea water, tightly holding the net. "See all this waste entangled in our net. Industrial pollution has killed our sea." 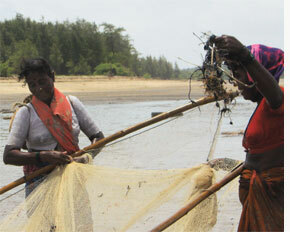 Kalawati, holding the other end of the net, added, "Earlier, even 14-year-olds would fish. Not anymore. Our men migrate to Porbandar and Okha in Jamnagar in search of work." 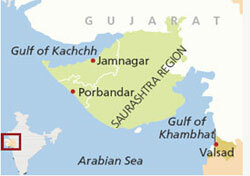 Kalawati and Parvati's husbands had left for Porbandar 15 days ago for eight months. Every year, fishermen from Tadgam and three other villages in Umargam taluka migrate to the Saurashtra region for fishing (see map). Parvati blames effluents from nearby Sarigam industrial area for turning her into a "ragpicker". The industrial area in Umargam taluka is a famous industrial zone of the Gujarat Industrial Development Corporation (gidc). It has industries ranging from dye and industrial spare parts units to chemicals companies and drug makers. A 17-km pipeline carries effluents from the industrial area to the sea (see 'Seaward ho! ', Down To Earth, November 15, 2002). When gidc laid the pipeline in 1999 people had protested. "Police force was used to silence us," recalled Parvati. Last year villagers got effluent samples tested at the Central Institute of Fisheries Education in Mumbai. The test report in November showed all fish in 100 per cent effluent concentration died in 12-18 minutes, "indicating a high level of toxicity". The test was repeated in March. This time all fish died within five minutes. In the past four-five years the number of chemicals factories in Sarigam has increased, worsening the problem, claimed Dashrath Rathod, former sarpanch of Saronda. Over 25,000 families in four villages are directly affected since they live near the pipe's mouth. Parvati has sold her boat. "There is no fish, so what is the use of a boat?" she said. Yatin Bhandari, sarpanch of Nargol village adjoining Tadgam, blamed Sabero Organics Gujarat Ltd, Aarti Industries Ltd and other chemicals factories for killing catch in the Tadgam-Nargol area, once known for its seafood export. "These are big companies, hence the pollution control board does not take action against them," he said. "Whoever protests is silenced either by force or by money. Even I was offered bribe but I refuse to be silenced." Industrial units at Sarigam dismiss the allegations. Aarti Industries, which makes bulk pharmaceuticals and dyes, states on its website, " In Sarigam, all (our) small units have formed a new company ... and have set up a common effluent treatment plant." But an assessment by the Central Pollution Control Board in 2005 showed the plant was not functioning properly. The spokesperson of Aarti Chemicals and the public relations officer of Sabero Organics, which makes chemicals for making pesticides, were not available for comments despite repeated attempts to speak to them. Villagers allege the pipe often leaks, killing crops and cattle. Even the groundwater is contaminated at a few places, they say. On August 22, labourers were repairing the pipe emitting pungent gas at the Tadgam beach. In early August the hinges of the pipeline had come off, and it was floating on the sea like a snake, said Rathod. V R Patel, regional officer of the Gujarat Pollution Control Board at Vapi, admitted the effluent in the pipe did not meet the standards even once in the one-and-a-half years he has been posted there. Notices have been issued to gidc and the Sarigam Waste and Effluent Management Company, he said. "We have told gidc to set up a common effluent treatment plant, but it has not done so," Patel added. gidc said it is replacing the pipeline. That's not enough for the people. They have formed an alliance and filed a petition in the Gujarat High Court demanding action against polluters. "We want the pipeline out of our village and our sea," announced Kalawati.